I don’t know about you, but my spending seems to come in waves. There will be times I don’t buy anything for weeks, and then, all of a sudden it seems like I have a giant credit card bill. Sometimes it’s due to a life change, a seasonal change or I find some wiggle room in my budget and decide it’s time to finally tackle a DIY project at home or revamp my wardrobe. 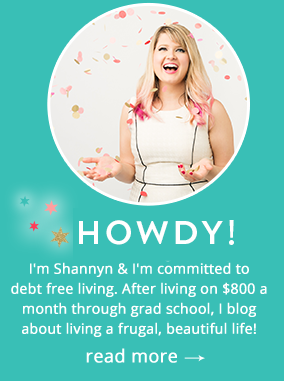 Spending more than you typically do can be part of the normal ebb and flow of life that’s necessary to keep your sanity intact, but if you’re consistently busting your budget and you feel out of whack with your finances, it may be time to reel it in. Whenever my budget’s about to bust due to overspending, here’s how I’ve curbed my shopping cravings…. Shopping can become a habit, but constant acquisition or spending time online looking for sales can usually spell trouble for your organization at home. If your focus is on consumption, chances are, you’re letting up slack at home and stuff is piling up. I love to spend time at home with my stuff and simply relish in what I’ve already collected. Other times, spending can be symptom of stress or a distraction from issues at home- but it can be therapeutic to grab the bull by the horns and get comfortable with what you’ve got. Organizing my closet, tackling the laundry, cleaning out the cupboards and organizing the tupper lids or actually ironing those high maintenance clothes puts things in perspective. Suddenly, there’s more than enough- and it soothes the need to spend. Simply be at home with your stuff, it’s amazing how it clears through the mental clutter as you sift through the physical clutter. 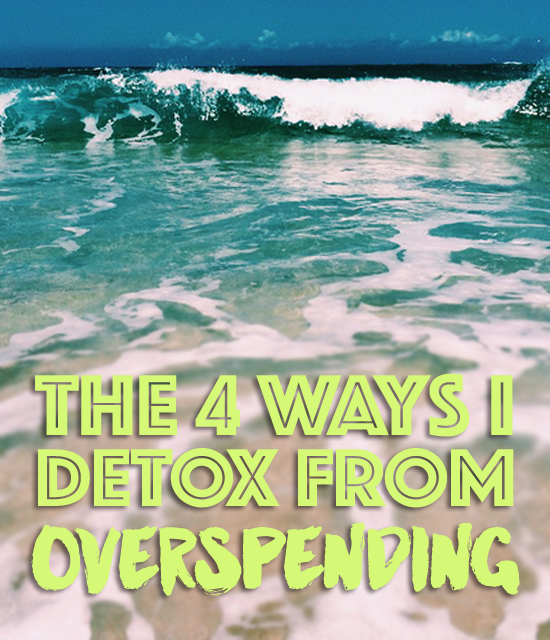 If I’ve been overspending, it’s usually a symptom of a hurried, chaotic life. If my grocery or restaurant spending is out of control, chances are I’ve been cutting corners because life has been cray-cray and I spend for convenience. When I need to cut back on my spending and reel in my cash flow, I literally have to slow down. I spend on autopilot when I’m flying too fast. Even if I can only afford to take a Sunday afternoon to meal prep, the hours in the kitchen can be at times frustrating (because there are thousands of other things I could be doing), but the act of chopping, prepping and batch cooking really helps me reset for the week. This concept works wonders for other aspects of my life as well- if I’m spending too much money, I’m probably not focused on what’s important. Yes, there are busy periods (like when I have to cut corners on food prep), but I have also find when I’m shopping, I’m not spending my time on things that matter- I’m looking at workout clothes instead of working out, or I’m online shopping instead of spending time with loved ones. Where your time goes, your money goes- I have to reassess every so often to ensure I’m on track. Yes, nobody wants to miss a deal- but if you’re aware of a sale at one of your favorite stores, it’s just too tempting to pass up. Unsubscribe from marketing emails, spend less time on Instagram and more time with a good book, and if a particular person, tv show or situation triggers you to spend, you may not be able to avoid them completely, but be aware how their stimulus impacts your mood. If I’m trying to cut back on my spending, I have to change what I’m looking at. If I don’t know a sale is going on, I won’t be tempted to spend. If I don’t really need something, I shouldn’t be shopping, no matter how good the deal is. Yes, I’m horribly out of the loop when it comes to deals sometimes, but it is hugely helpful to keep my budget healthy after I’ve spent a bunch. It’s going to cost me about $900 to get a plane ticket to Paris. I am saving $2 a day, and will hit my goal pretty painlessly in about a year and a half. I’ve set a baseline that even if I have a rough month, I can still hit my goal. That’s the thing- if you abstain from spending, you can reward yourself by topping off your goal account for the week with a really compelling dream to achieve. If you have a crappy month, that’s okay too- if you can only put away $1 a day or $2 a day with an automatic savings plan (like I have one with CapitalOne360), you are still making progress. There will be ups and downs, and when you can, save more, and when you can’t, you still got your goal on lock, and it feels good! It’s all about balance! Ups and downs come and go, these things happen. I’m so embarrassed. It’s so easy to swipe those credit cards, now I’m in a little over my head. I sat down this evening and got my plan together though. Need to fight off temptation and requires discipline. Great advice, everyone should read! This collection of a few pennies a day for something bigger is a very good idea, maybe this way I can save on a few things that I can never put down. Your post was really excellent and informative.